When it’s sunny out, it’s a shame to be inside cooking. I much prefer to use our Weber grill, even if it requires a little more work. I’ve loved grills ever since I was a child, when the time spent lighting the coals and making sure that everything was cool afterwards made a simple meal of hamburgers seem like an epic endeavor. There are few times I won’t choose the grill as a cooking option when the weather allows it, and there are few things that I can’t find a way to grill. 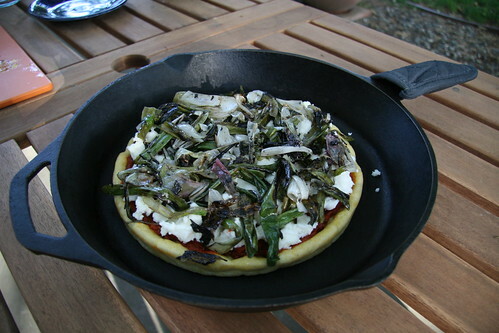 This week’s food, spring onions, were straightforward enough—all they needed were a couple slices, a bit of oil and about 10 minutes to be soft, sweet and charred—but I wanted to go beyond just the onions and cook the entire pizza that we put them on à la Weber. I began with a bunch of spring onions from Good Humus in Capay, CA. 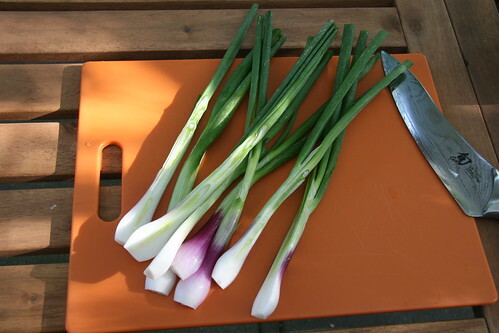 Spring onions are somewhere around the half-way point in onion growth, more obviously onions than their green counterparts, but still endowed with tender and flavorful shoots. Their appearance at our markets seems a touch haphazard, but as long as they’re around, I’ll buy them. 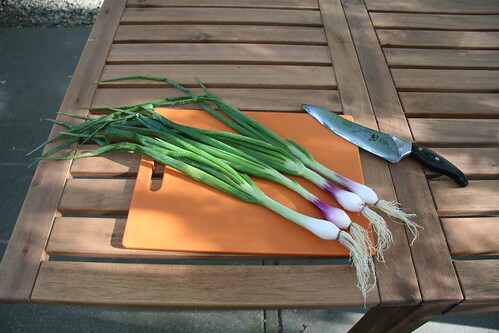 I washed and trimmed each end of the spring onions and sliced them lengthwise, arriving at approximately foot long halves. I tossed the trimmed onions in a mix of olive oil and balsamic and red wine vinegars, then let them soak in it for about 10 minutes. While the spring onions marinated, I threw a patty of Italian sausage on the grill. While this sausage, from the Nugget, was decent, it was called “hot” but tasted “mild” to me. 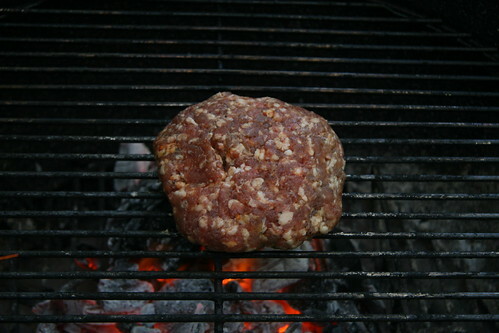 I pushed the nicely browned sausage patty over to a cooler area to finish cooking, and added the spring onions to the grill, directly over the mesquite coals. 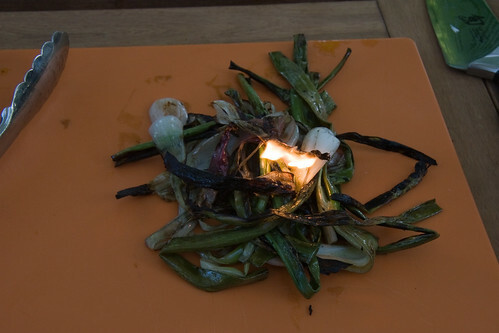 There were some flames as the oil dripped, and the onions sizzled nicely. After about 10 minutes, I pulled the onions off. One of them was still flaming on the cutting board—more delicious char. The sausage continued to cook, and Jen began putting together the rest of the pizza. 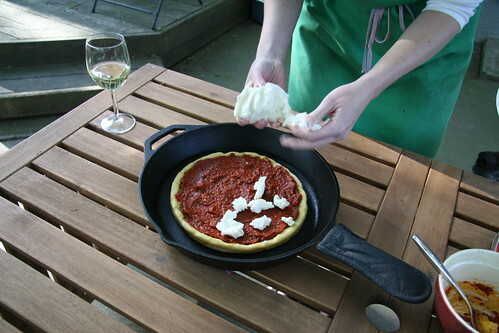 We used a cornmeal crust (also from the Nugget). 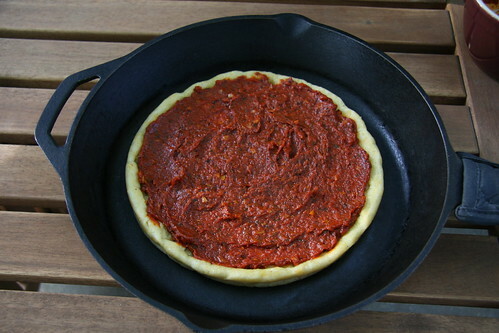 First came a sauce she cooked up mixing tomato paste, olive oil, garlic, red wine and Italian seasoning. Next came some nice, low-moisture mozzarella. I chopped up the spring onions and we added those to the pizza. We had a bit more than we needed, so we enjoyed a few straight. The grilling had made them sweet and melty, and the charred bits were just a little crispy. 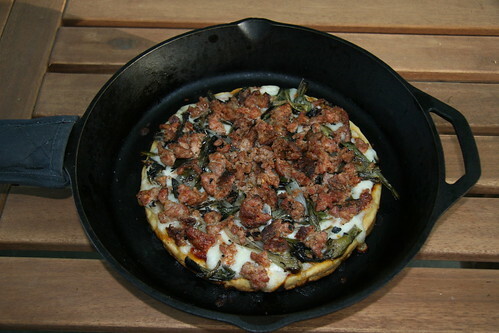 Looking back, the pizza could even have stood on its own without the sausage. 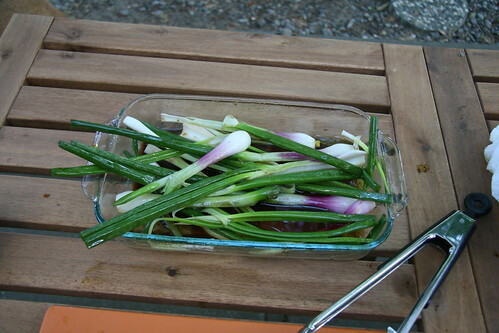 The onions really had great flavor and richness thanks to the oil, vinegars and grill. 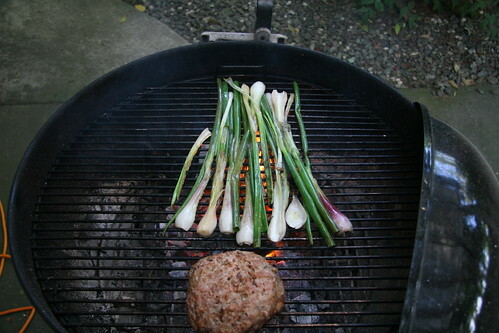 Finally, we removed the sausage from the grill, crumbled it, and placed it atop the spring onions. 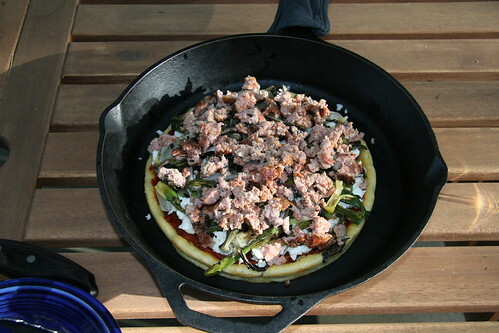 We placed the pizza (in a Lodge skillet) on the grill and let it cook for about 25 minutes, until the cheese was melted and began to turn golden at the edges. It was a delicious dinner, but I did burn my mouth a little on the hot mozzarella, so exercise caution and patience if you make this yourself.